Submitted by Emily Brightwell on Mon, 2006-07-24 23:57. A theatre critic is found dead in a canal - but it is soon discoverd that he drowned in a bathtub! Known for his savage reviews, the victim has a full cast of enemies. 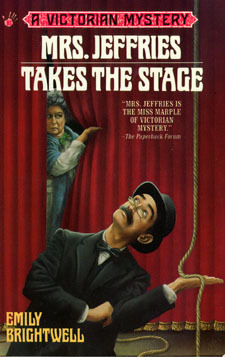 While Inspector Witherspoon investigates the theatre, Mrs. Jeffries uncovers the critic's secret past - a real-life drama more compelling than any stage play!